?We call our BMW series Schizzo,? says owner Marcus Walz, ?because it?s schizophrenic how many possibilities there are to build up a bike on the same simple base.? WaltzWerk know better than most: they’ve racked up an impressive eleven Schizzo scramblers this year alone. 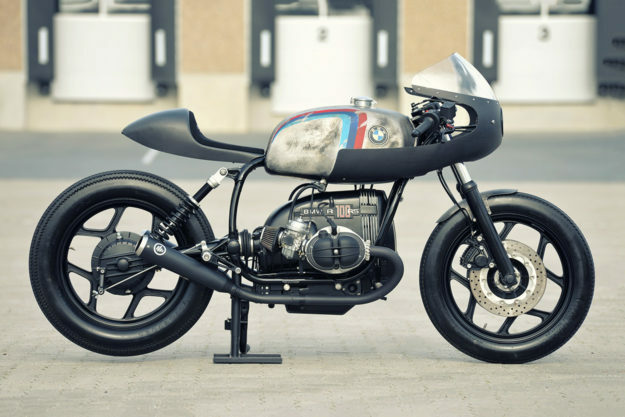 Now they’ve changed direction with their first Schizzo cafe racer?based on a 1984 BMW R80 RT Monolever. At a glance, it appears to be a simple machine. But Marcus and his team aren’t known for doing things in half measures. ?Like always, we took the bike totally apart and built it from the ground up with about 90% new parts,? he explains. ?We only re-used the main frame, the engine and transmission case, the wheels and the gas tank. The rest is pretty much brand new. So you can say it?s a brand new bike with an old title!? Most of the budget went into the engine. Starting with a R100 RS mill, WalzWerk installed a 1070cc kit from Siebenrock with lighter pistons and cylinders. They also added their own electronic ignition, new cylinder heads with bigger valves and upgraded valve guides, a racing cam and rods, and a balanced, forged crank shaft. Oh, and they fettled the carbs too. A solid round of dyno testing and tuning returned a healthy 82 horses at the rear wheel. That’s a lot of heft for an old airhead?so WalzWerk reinforced the frame in the neck and engine mount areas, to help it cope. The rest of the frame’s been de-tabbed, and treated to neater rearset and exhaust mounts. There’s a new subframe out back?a bolt-on unit designed to appear like it’s floating, with an LED embedded in the tail. The fairing and tail piece are one-off units. To create them, the team shaped negative forms out of sheet metal, before making positive forms with fiber glass. The final parts were then formed with carbon fiber. ?That was very complicated,? says Marcus, ?but the result paid off.? There?s a new custom-made bracket to attach the new fairing to the existing mounting points on the frame. Behind it are a set of Gilles clip-ons, adjustable LSL levers, and a speedo and bar-end turn signals from Motogadget. The front suspension is from a BMW K100?rebuilt with NOS fork tubes and legs, and lowered 70mm with progressive springs from Wilbers. The triple tree is NOS too, but WalzWerk cleaned it up on their mill, and closed the old handlebar mount holes with aluminum plugs. Braking upgrades include a Brembo master cylinder from a Ducati Monster, along with two-piston calipers and drilled stainless steel rotors. To keep things uber-clean, the brake line runs down through the steering neck. There’s an adjustable YSS shock keeping the back in check, and a set of Tarozzi rear-sets. A super-light Lithium-ion battery is tucked away in a custom-made box under the transmission.